William Sebastian Cohen (born August 28, 1940) is an American politician and author from the U.S. state of Maine. He is a member of the Republican Party. Cohen was a member of the city council of Bangor, Maine from 1969 to 1972, and also was mayor of this city from 1971 to 1972. He served as both a member of the United States House of Representatives and United States Senate from Maine, and as Secretary of Defense (1997–2001) under Democratic President Bill Clinton. BBC News hired Cohen as a world affairs analyst in May 2016. Cohen appears in this capacity on BBC World News America and other broadcasts. He also serves as an Advisory Board member for the Partnership for a Secure America. Cohen is also a member of the ReFormers Caucus of Issue One. 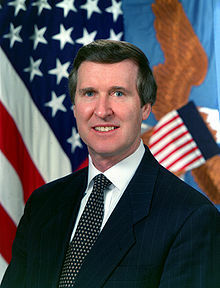 William Cohen is partly of Jewish descent (his father was Jewish). On February 14, 1996, Cohen and Janet Langhart were married. Langhart is a former model, Boston television personality, and BET correspondent. Janet Langhart was known as the "First Lady of the Pentagon" during Cohen's tenure as Secretary. Cohen served as Best Man in then-Senate Naval Liaison John McCain's second wedding (Gary Hart was a groomsman). McCain later became his Senate colleague. On the afternoon of June 10, 2009, Cohen was present at the United States Holocaust Museum, waiting for his wife Janet Langhart, for the world premiere of her one-act play, Anne and Emmett. The play imagines a conversation between Anne Frank and Emmett Till. While Cohen waited, an elderly man with a long gun attacked the facility, fatally shooting a security guard before being wounded himself by the other guards. Cohen and his wife were not injured during the attack. ↑ "William S. Cohen - William J. Clinton Administration". Office of the Secretary of Defense - Historical Office. ↑ Kuttler, Hillel (1997-01-26). "Cohen new Pentagon chief". Pqasb.pqarchiver.com. Retrieved 2009-06-11. ↑ Grinapol, Corinne (May 31, 2016). "William Cohen Joins BBC News as a World Affairs Analyst". Ad Week. Retrieved June 13, 2016. ↑ "Issue One – ReFormers Caucus". ↑ "FindArticles.com - CBSi". www.findarticles.com. ↑ "Arizona, the early years". Azcentral.com. Retrieved 2009-06-08. ↑ Brevis, Vita. "State of the Nation". Daily Kos. Retrieved 2009-06-11. ↑ Ruane, Michael E.; Duggan, Paul; Williams, Clarence (June 11, 2009). "At a Monument of Sorrow, A Burst of Deadly Violence". The Washington Post. ↑ "Republican ex-defense secretary Cohen backs Hillary Clinton". This page was last changed on 15 February 2019, at 15:57.